There’s a movie out right now called “Paris-Manhattan” but that is actually just a pretty massive coincidence. I haven’t seen this French homage to the films of Woody Allen, but I’m certainly willing to piggy-back on it by accident. What actually happened was I was looking for a cocktail that justified the big bottle of rather expensive St. Germain elderflower liqueur I’d recently sprung for. The Paris Manhattan is what I found. Difford apparently was somehow involved in the creation of St. Germain, which has become the go-to elderflower liqueur for almost everyone, and he therefore has a vested interest in this cocktail. Indeed, I personally think he put just a bit too much of it in his drink. No worries, though, because I’ve fixed it! Combine the liquid ingredients in cocktail shaker or mixing glass and stir vigorously. 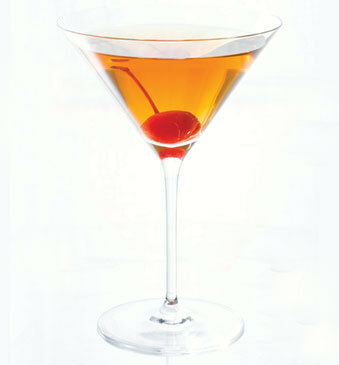 Strain into glass and add the cherry or orange twist garnish of your choice. Drink to Paris, Manhattan, some other city, or just drink. You’ll be fine. I actually tried shaking this one, but it really didn’t work. The extra water and ice crystals simply didn’t add anything, while nevertheless detracting from the flavor. More importantly, I found that I thought the original recipe, which called for a full ounce of St. Germain, was too sweet — though I liked the results better with the remainder of my nearly consumed Templeton Rye than with Old Fitzgerald bonded bourbon. Oddly enough, no recipes I found online called for any less of the very sweet, you might say honeyish, liqueur. I nevertheless tried it with only half an ounce of the elderflower liqueur, and that was a major disappointment. It didn’t taste any less sweet but was just kind of sharp in an unpleasant way. Then, I tried only 3/4 of an ounce with the rye and — because I was running out, just a whiff of Canadian Club Sherry Cask. Bingo.